NEMA has confirmed the the multiple attacks on Kofa village in Borno State. 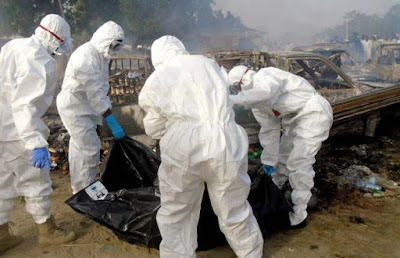 Abdulkadir Ibrahim, Information officer, NEMA North East, in an update to GIFTED BLOG said a total of four suicide bombers were involved in the incidents. According to him, two female suicide bombers were intercepted when they tried to gain access into Dalori 2 Internally Displaced Persons (IDPs) camp around 9am Monday morning. Two other female suicide bombers also detonated their explosives at the adjoining Dalori kofa village at about 8.10 pm where they killed 16 people. “The injured victims have been administered with first aid and transported to hospitals within Maiduguri for treatment,” he added.